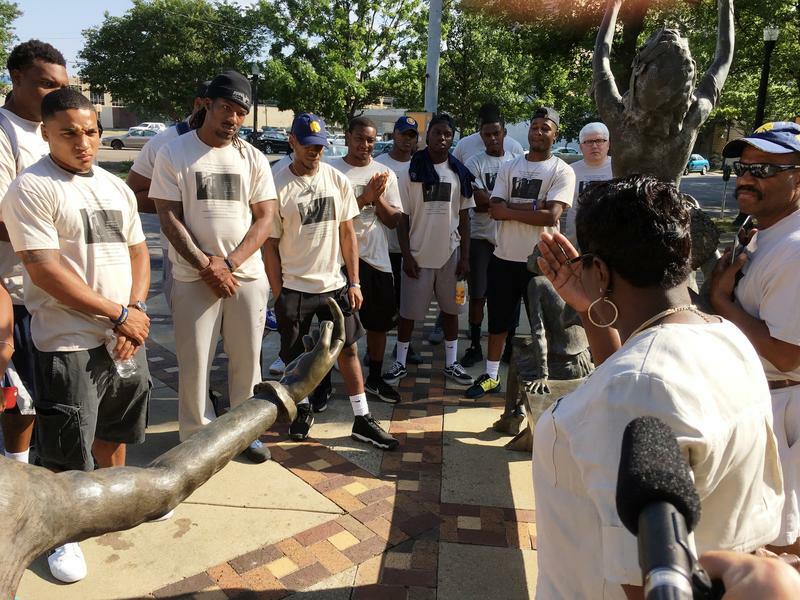 Tour guide Patricia DeLaine introuduces Texas A&M University-Commerce students to historic Kelly Ingram Park in Birmingham, Ala.
A&M-Commerce students in Birmingham. The historic 16th Street Baptist Church is in the background. 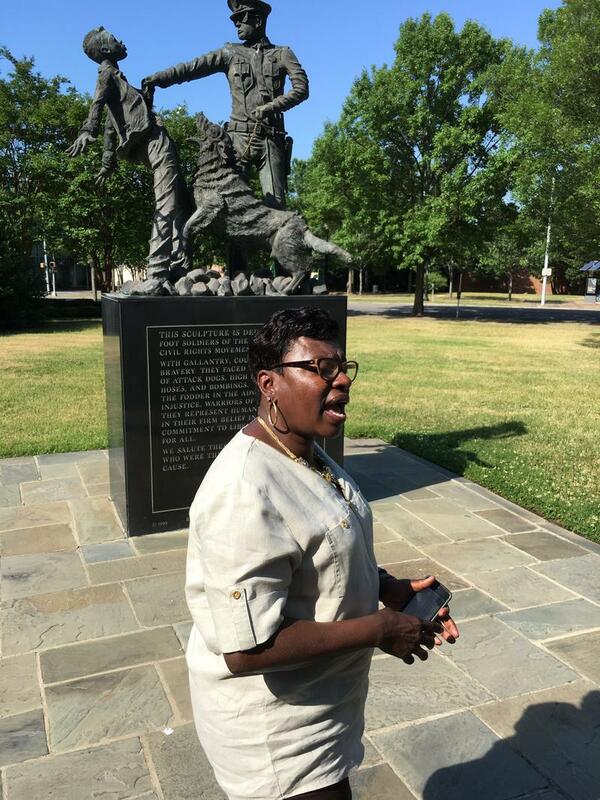 Patricia DeLaine leads a tour of Kelly Ingram Park. 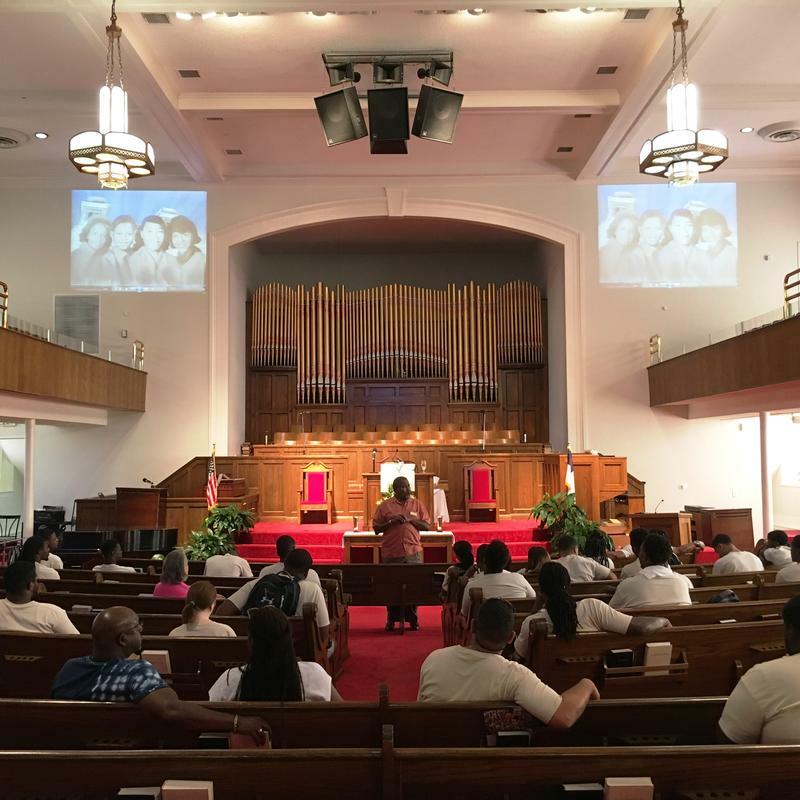 Students hear a presentation inside 16th Street Baptist Church. 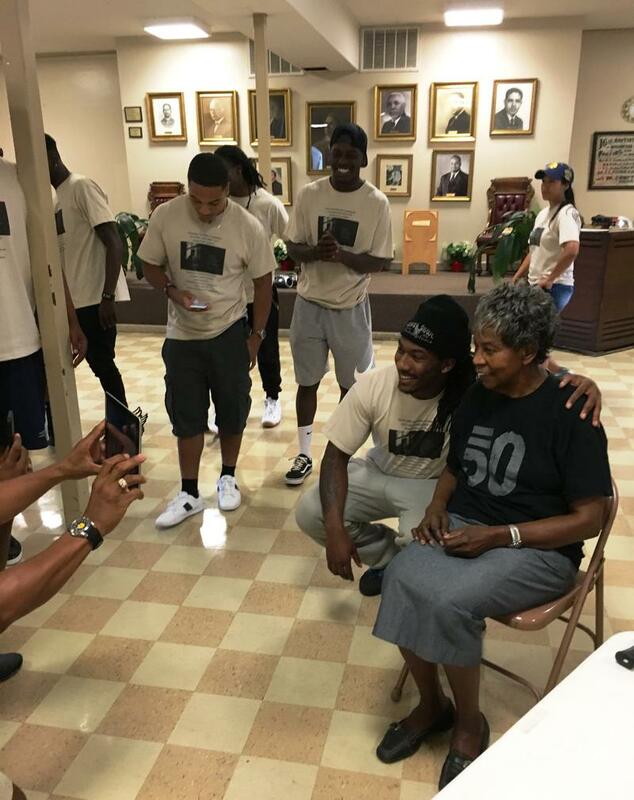 Longtime civil rights activist Myrna Jackson addresses A&M-Commerce students in the basement of 16th Street Baptist Church. Students hear Myrna Jackson's story in the same basement where four girls were killed in a 1963 bombing. Student Jeremiah Walters poses for a photo with Myrna Jackson. A&M-Commerce Director of Alumni Relations Derryle Peace enjoys a laugh with civil rights activists Joann Logan and Sarah Logan. 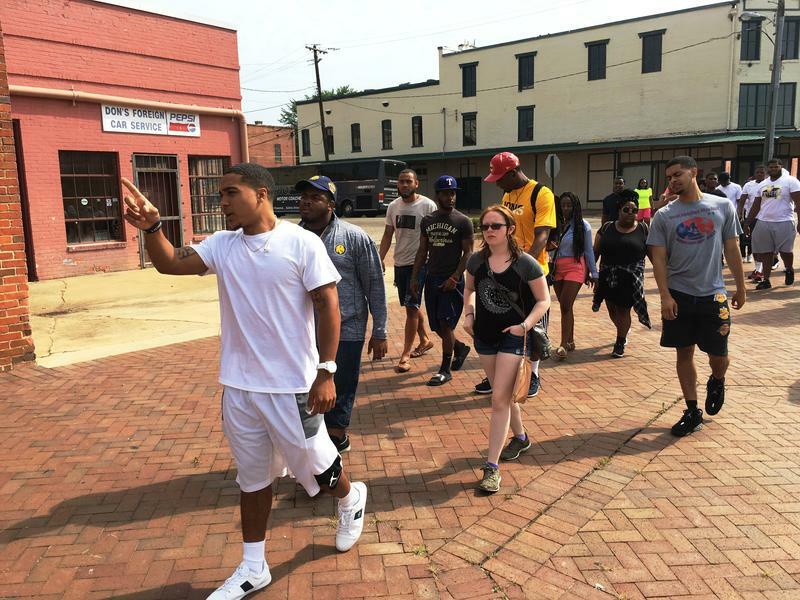 Students Richard Cooper, Chris Richardson, Devon Watson and others walk through downtown Selma, Ala.
Kia Price photographs the historical marker at the site of Bloody Sunday in Selma. 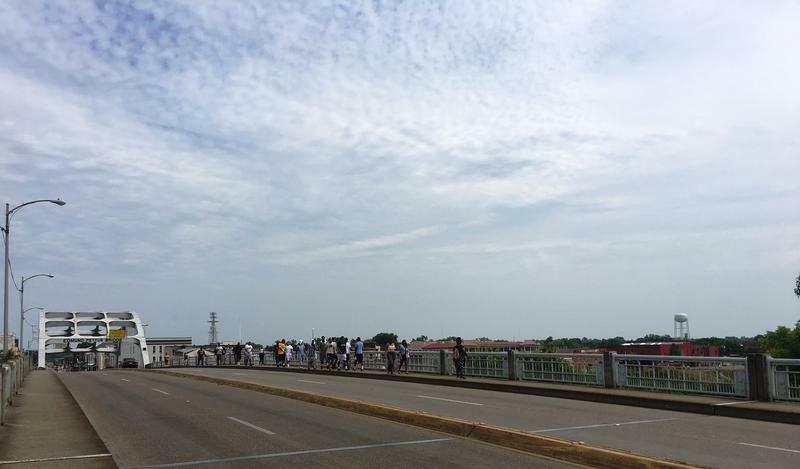 A&M-Commerce students cross the Edmund Pettus Bridge in Selma. Student Sonia Smith-Miller reads an exhibit at the Lowndes Interpretive Center on the Selma to Montgomery National Historic Trail in Alabama. 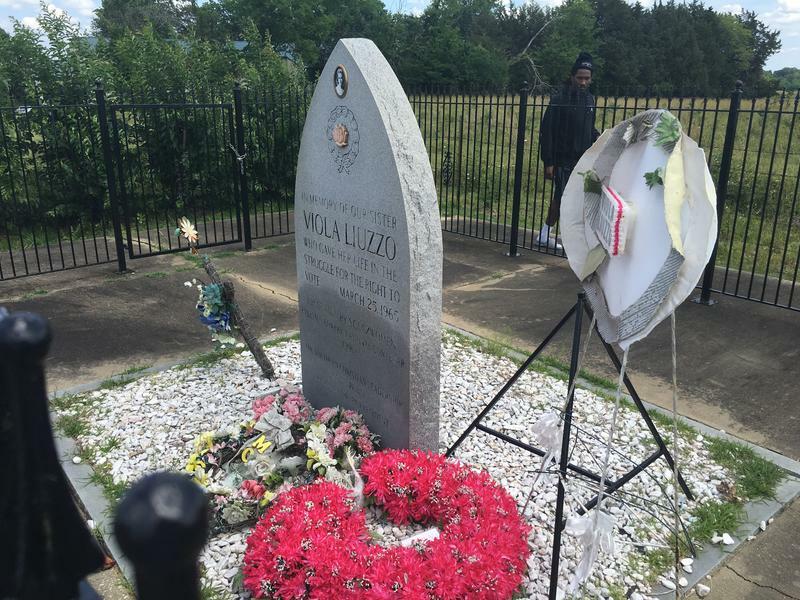 Jeremiah Walters pauses at the memorial for slain civil rights worker Viola Liuzzo. 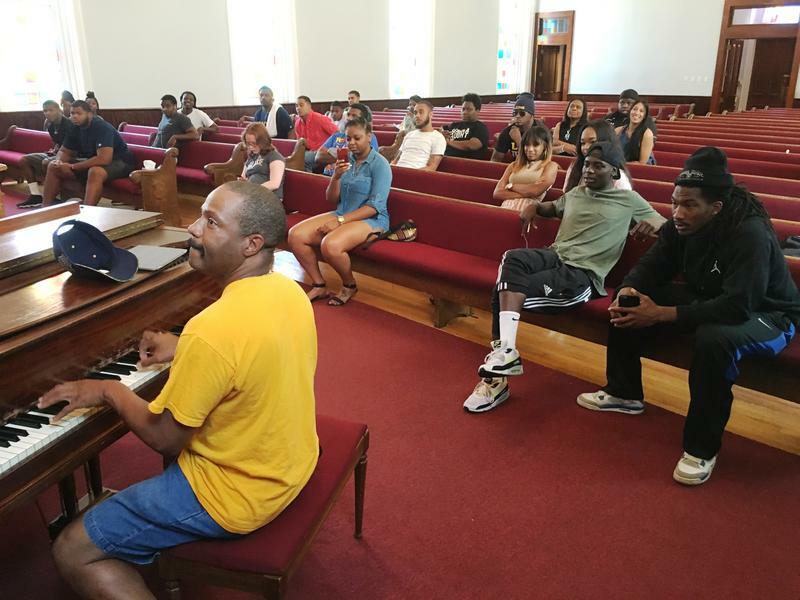 LaVelle Hendricks entertains students at the Dexter Avenue Baptist Church in Montgomery, Ala.
Buck Wilson plays the piano while LaVelle Hendricks looks on. At right are students Zene Amaning, Traven Johnson, Trey Porter and Jeremiah Walters. 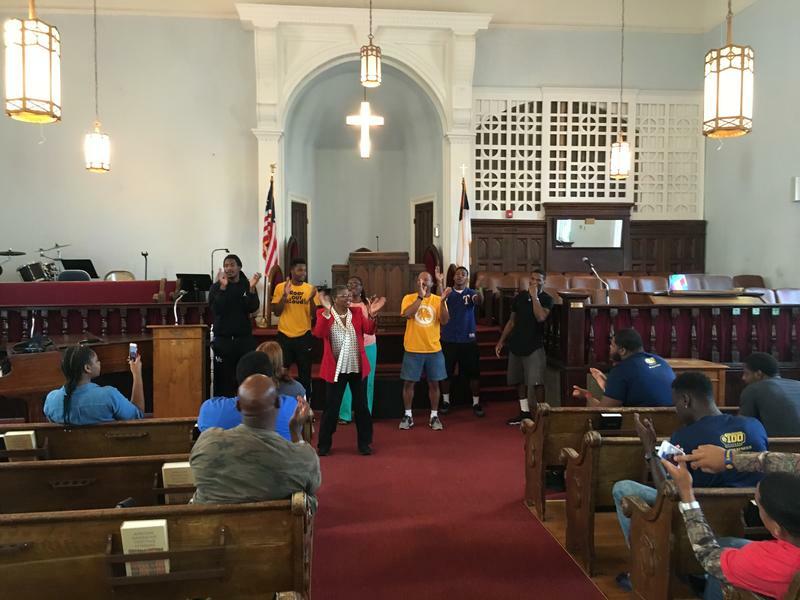 A tour guide tells students the story of Dexter Avenue Baptist Church in Montgomery. Students sing in the sanctuary at Dexter Ave. Baptist Church. Buck Wilson and tour guide Dr. Shirley Chambers at the Dexter Ave. Baptist Church Parsonage, a former home of Dr. Martin Luther King, Jr.
Every summer since 2013, Texas A&M University-Commerce students have had the opportunity to tour, on a university-sponsored trip, sites in Alabama relevant to the Civil Rights Movement. Perhaps more importantly, the tours have also included presentations by and conversations with activists and others who experienced that era. Alumni Frank and Rosalie Turner, Director of Alumni Relations Derryle Peace, and Assistant professor of Psychology, Counseling and Special Education Lavelle Hendricks have been among those instrumental in organizing the trip. Rosalie Turner's historical fiction novel "March With Me" inspired the series of tours. 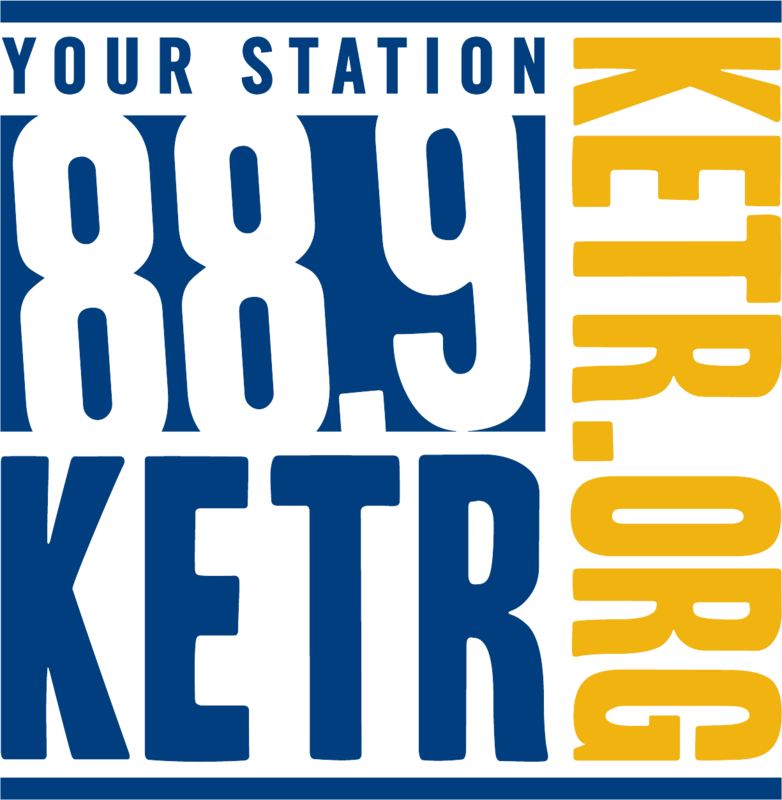 KETR's Mark Haslett accompanied the group on the 2016 trip, described in this feature. Pres. Lyndon B. Johnson: Americans of every race and color have died in battle to protect our freedom. Americans of every race and color have worked to build a nation of widening opportunities. Now our generation of Americans has been called on to continue the unending search for justice within our own borders. We believe that all men are created equal. Mark Haslett: President Lyndon Johnson addressing the nation on the occasion of his signing of the Civil Rights Act of 1964. Those who lived through the Civil Rights Movement in the United States might remember some of those times as if they were only a decade or two ago. But the Civil Rights Act and the Voting Rights Act that followed a year later are now more than half a century old. Our collective memory is fading. Racial issues remain at the forefront of our national conversation. But our remembrance of the fight for racial justice is in danger of becoming a vague collage of clichés and images. One way to grab hold of that elusive history is to go to where so much of it happened -- to go to Alabama. Haslett: You’re hearing Texas A&M University-Commerce students in the same church where Martin Luther King Jr. pastored in Montgomery. 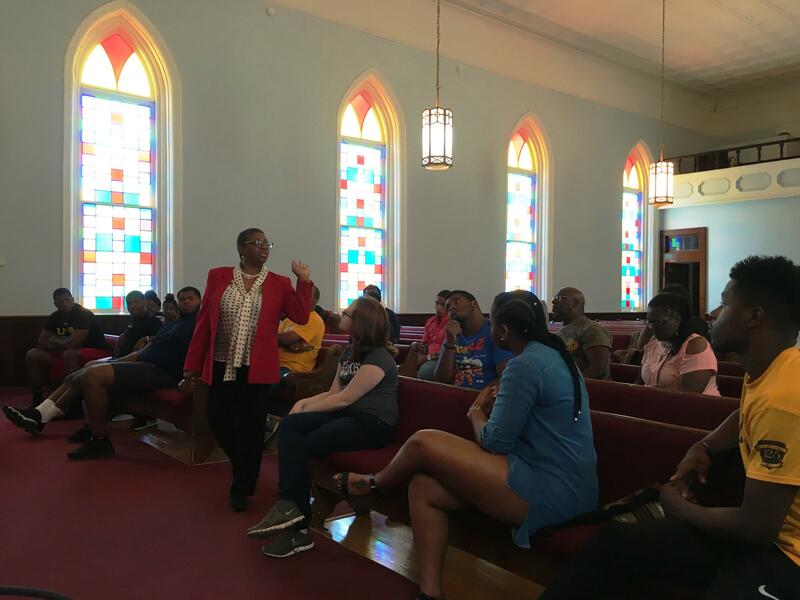 Earlier this summer, 28 students and a few faculty and staff went to Alabama - on a tour of some of the most important sites in the history of the struggle for civil rights. Buck Wilson: Well when I first came down here, I thought I knew something about black history, but I see that I know nothing. It really educated me. I’m really glad that I came to see the roots. Its different reading and researching about it, but to talk to people that actually been through it and they family went through it. See how they effected, and I can see how it really affect us. Haslett: That’s Buck Wilson, a graduate of Commerce High School and now a student at A&M-Commerce. The trip began in Birmingham. 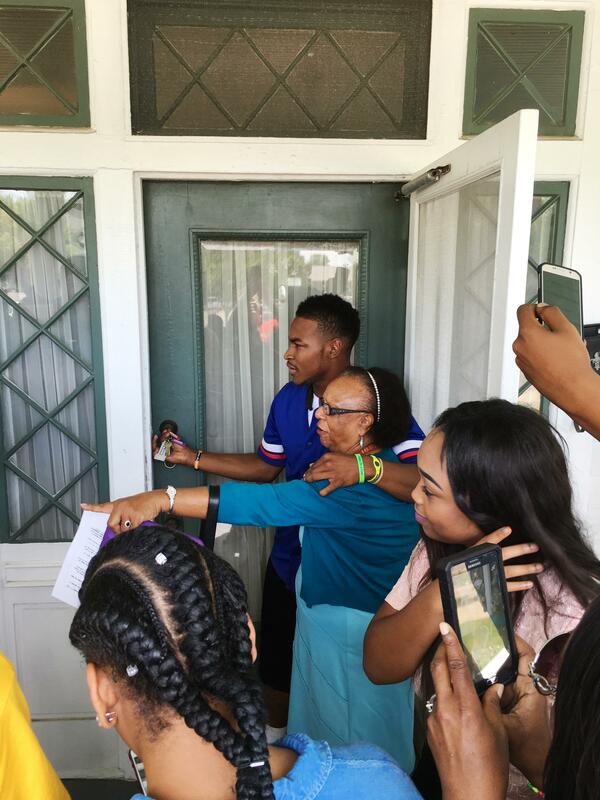 The visit was a kind of homecoming for Dr. Henry Ross, an instructor in the university’s Department of Health and Human Services. 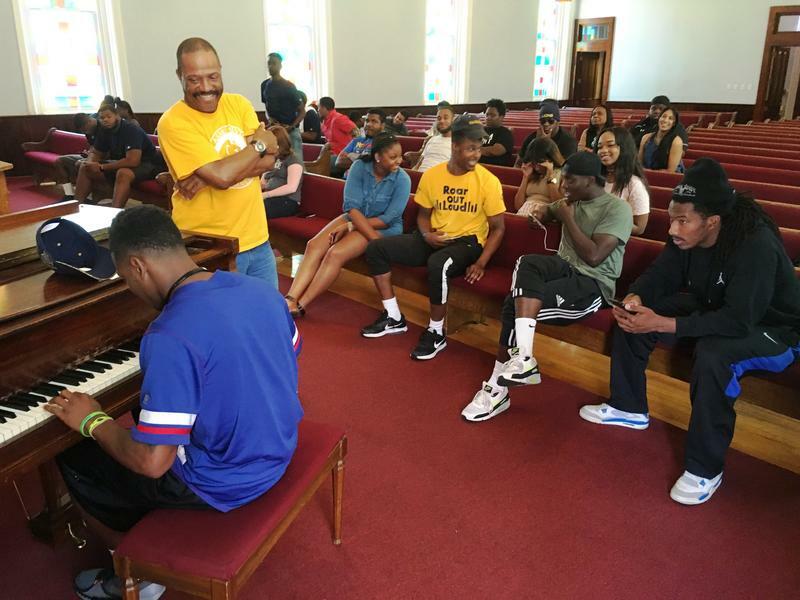 Ross drove his own car through the streets of downtown Birmingham as he and the students’ bus made their way to the 16th Street Baptist Church. 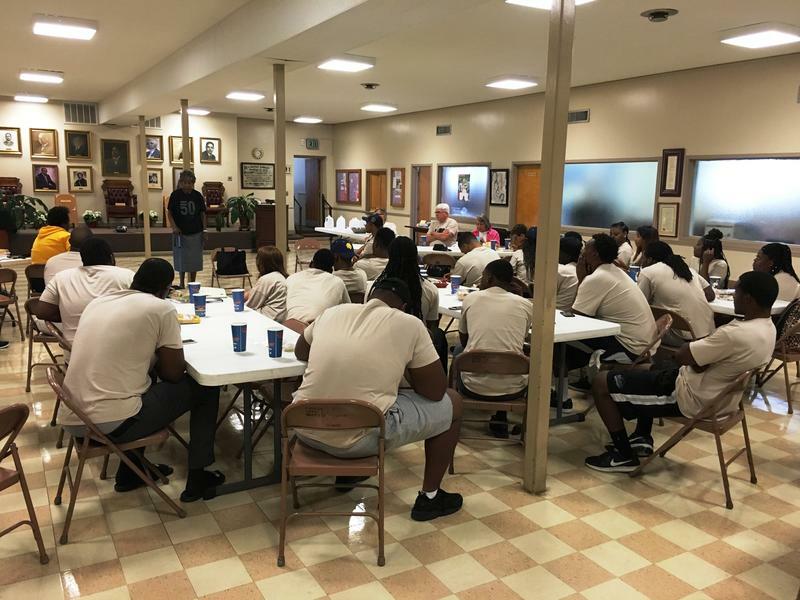 Dr. Henry Ross: Indeed, it’s always a joy to come back home, but, as I mentioned, I was 7 years of age when the turmoil was occurring in Birmingham. I can remember, on the morning that the church was bombed, feeling the shake and all hell broke loose in Birmingham on that particular day. Haslett: The bombing Ross is referring to happened on September 15th, 1963. Four members of the Ku Klux Klan planted a bundle of dynamite just outside an entrance to the church. When the explosives went off on a Sunday morning, the blast injured 22 and killed four girls who were putting on their choir robes for a children’s service. Three of them were fourteen years old. The other was 11. Ross: There were a lot of ambulance moving, a lot of people moving, trying to get downtown to see what was going on. I can remember my mom sitting and being extremely worried. We were on our way to Sunday school, as a matter of fact. Haslett: That church was, and to a certain extent, still is, the center of political life as well as spiritual life for African-Americans in Alabama’s largest city. The bombing took place within the context of extreme unrest as conflicts played out over school integration, public transit integration, voting rights – every aspect of public life. 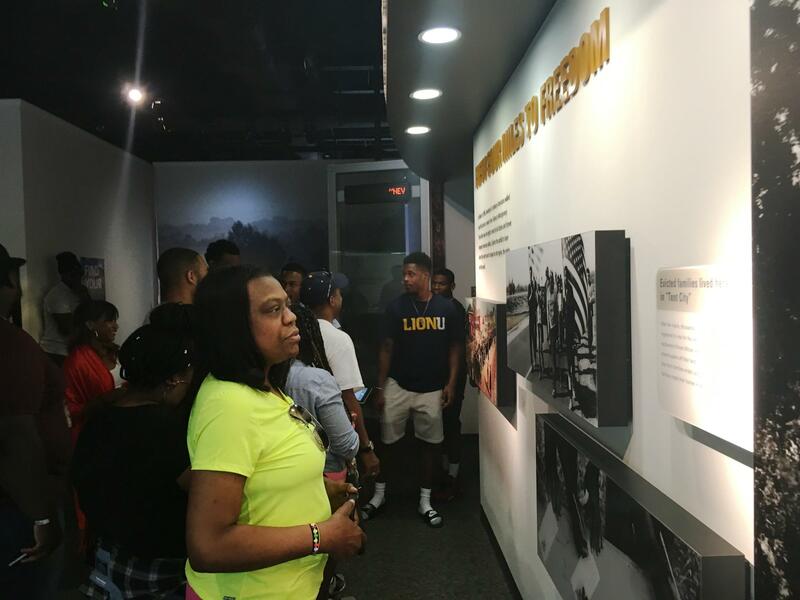 The thing that made this university-sponsored tour different from a civil rights history tour that anyone would take is that the students got to hear from the people who lived the story. 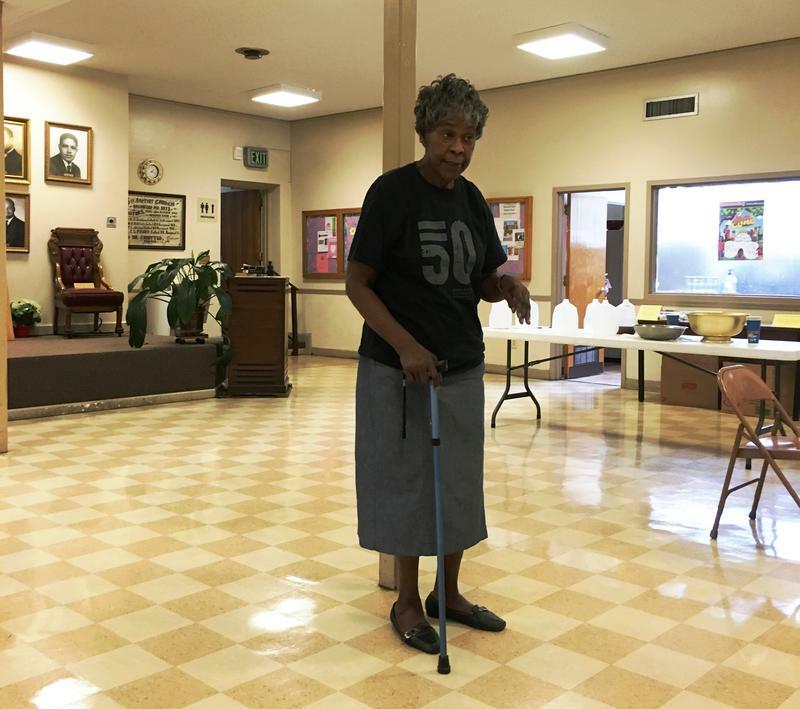 Haslett: That was Myrna Jackson, an organizer during the 1960s who remains active today. 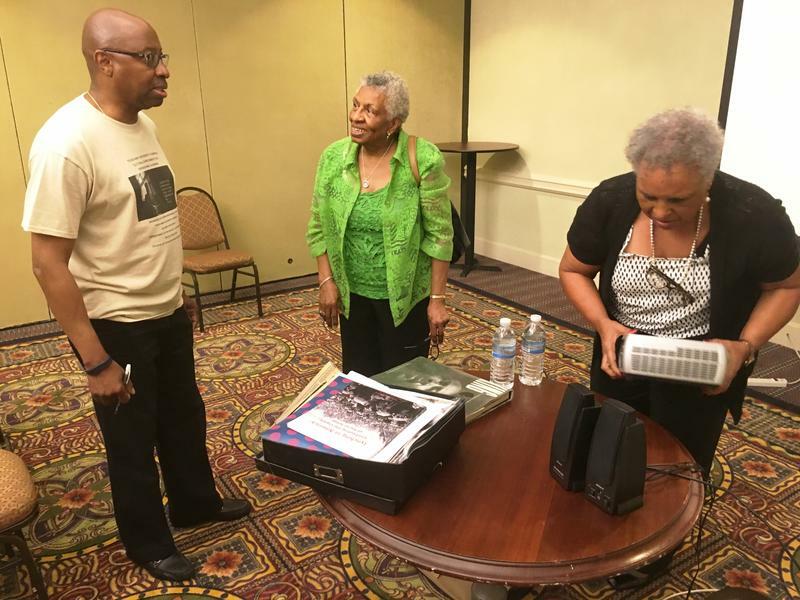 She was one of several activists and ordinary people who shared their account of the civil rights era with A&M-Commerce students. And that whirring noise in the background? That’s the air conditioner in the same church basement where the four children were killed in the bombing. The tour group had a lunch of cold sandwiches and sweet tea there right before Ms. Jackson spoke. That kind of living history was not lost on students like Jasmine Baker. Jasmine Baker: To me, it’s inspiring to me. These foot-soldiers and these people who fought for us, and how much they emphasized that we cannot allow this to happen again. And how important this is, because they understand this is still very relevant. What they’re saying is still very relevant to this day, and we have to understand that and take that for what it is, in terms of our elders, our elders telling us that. Haslett: I spoke with Baker on the tour bus a few yards from the bridge at Selma, Alabama, the scene of the infamous Bloody Sunday of 1965. Several hundred nonviolent marchers on their way to the state capitol at Montgomery to seek voting rights were dispersed by State Troopers, some on horseback, others using nightsticks. Many marchers were injured, some were hospitalized. The event helped lead to the passage of the Voting Rights Act. Today, the Selma to Montgomery Voting Rights Trail is a U.S. national Historic Trail managed by the Park Service. 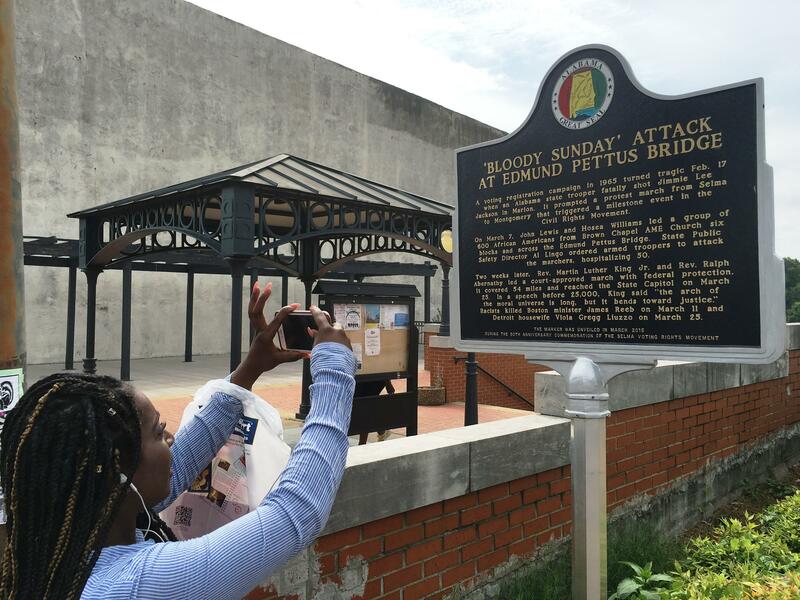 By the time the tour group made it from Birmingham to Selma and finally to Montgomery, some students reported being changed by the experience. Richard Cooper: It really opened my eyes up more to just be more observant of what’s going on around me in my generation. Talking to the older people and they stuff they did in their generation and the stuff they had to go through and the things they did to change it just for my generation. It kind of makes me look around and see what can I do. Even the little things, the small things, because it starts within yourself and within your community. And that’s what I learned too. I was talking to one of the older ladies, she said it’s all within you and it starts within you. Haslett: A&M-Commerce student Richard Cooper. 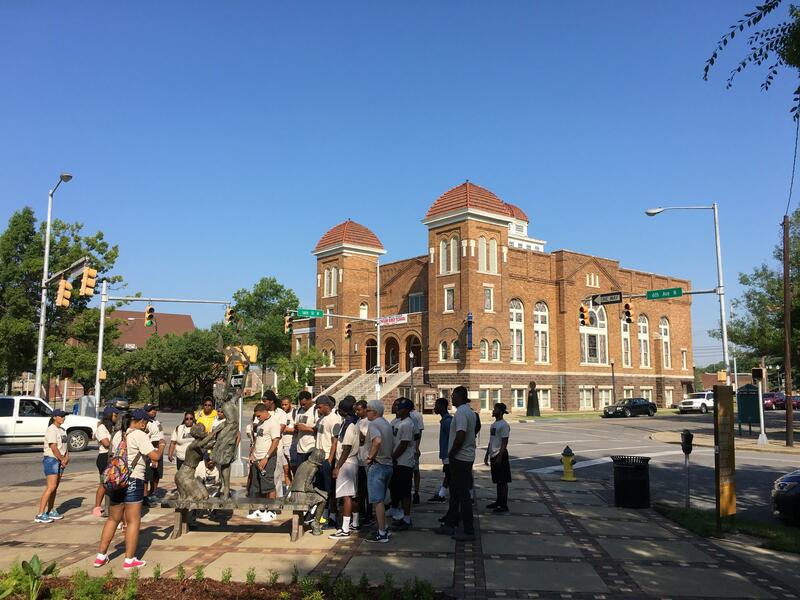 In Montgomery, the students learned the story of Rosa Parks and the Montgomery bus boycott, which lasted more than a year and resulted in the integration of the city’s transit system. The group also toured the Rev. Martin Luther King, Jr.’s Dexter Avenue Baptist Church as well as Dr. King’s parsonage, which is where I spoke with Cooper. Cooper: Yeah. I see myself having kids, and I’m just gonna tell them. I’m going to let them know, hey your pops was over there. We seen all that firsthand and I’m going to teach them as much as I experienced on this trip. And not only that, I’m going to try and bring them over here, too, and let them experience it themself. Anything they learned in history, just open their eyes. I feel like you learn better when you’re hands on and you see it for yourself, especially I don’t know if they’re going to be able to talk to the people that lived, since the timing. But I do wish that they could talk to the people that lived it and experienced and see it themselves. I want to let them learn like that, experience, learn through experience. Haslett: Back on the bus by the bridge in Selma, A&M-Commerce student Sonia Smith-Miller. Sonia Smith-Miller: I was telling her, you can read it in a book, but then you’re reading from someone else’s interpretation. That came straight from her, so now I know it’s real and it’s true. It came straight from you, so someone else can throw something in there, but I have my own experience now, and that’s invaluable. And like you said, these are older people, next year they may not be with us, so I’m glad I had the opportunity to hear them now, then to read an obituary or to read what they had done before. That’s a blessing in itself. I could sit and listen to those people all day long, for hours and hours and hours, because history is a passion of mine, especially black history. My grandmother, I could just sit for hours and listen to her, she just ran talk about anything, but I was just hanging on every word. And just like the speakers we had here, I’m hanging on every word, and I’m seeing the expressions in their faces, the voices, their mannerisms, everything, and it’s like wow, wow. And I often said last night thinking, could I have done that? Could I have been that passionate about something to where I risked my life? That’s a big question for me now. I don’t know if I could have done it. I really don’t. And it makes me proud to know that they put their lives on the line for me, for me. Don’t even know who I am, didn’t even know I was going to exist, but just in case I’m going to fight hard now because those that’s coming behind me, they won’t have to fight as hard. And that’s my thought pattern with me and my daughter. I’m coming back to school to make sure that her life is better and she don’t have to deal with the same struggles I deal with. I’m fine, but it’s her that I’m most worried about. And what direction this world is going in, I don’t know. It’s uncertain. Haslett: Texas A&M University Commerce student Sonia Smith Miller speaking in Selma, Alabama, during the recent university-sponsored civil rights history tour. For KETR News, this is Mark Haslett.